If you are reading this post, no doubt you have run into an issue uploading files to your WordPress site, and are looking for a quick fix. Today we will show you how to increase the WordPress upload limit with easy. WordPress has a limit for uploading images, videos, and other files. It’s a similar story for your PHP memory limit, which helps you run plugins and scripts. You can quickly check your WordPress upload file limit in your WordPress installation if you navigate to WP Admin -> Media -> Add New. You will see the current max upload size on the bottom as shown in the screenshot. By default, maximum upload size in WordPress ranges from 2MB to 200MB depending on the settings of your web hosting provider is giving by default. One way to increase maximum file upload size in WordPress is to modify the theme functions file. Just add the following code in the theme function’s file and your upload limit will increase. By finishing this tutorial you have learned how to increase the maximum upload file size in WordPress. You will be able to upload bigger files from now on. The above methods are tried and tested by many users across the internet. However, if these methods to increase the maximum file upload size in WordPress do not work for you, simply ask your hosting provider to increase the file size upload limit on your WordPress installation and they’ll surely help you out. 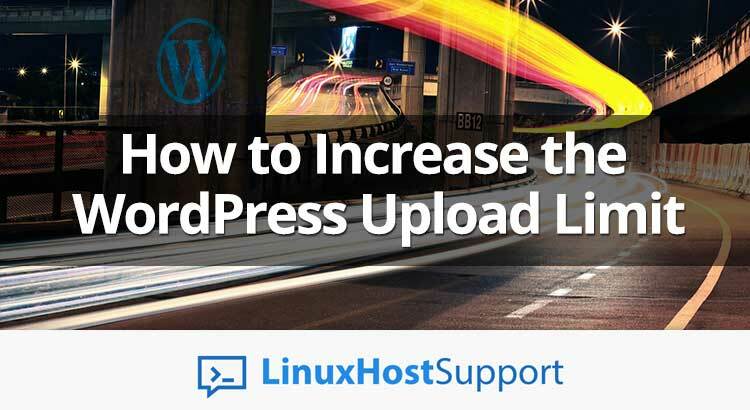 Of course you don’t have to do any of this if you use one of our Hosting Support Services, in which case you can simply ask our expert Linux admins to increase the Maximum File Upload Size in WordPress for you. They are available 24×7 and will take care of your request immediately.